Engraved charm bead personalised with your loved ones miniaturised hand or footprint and their initials and the message of your choice onto the reverse side. 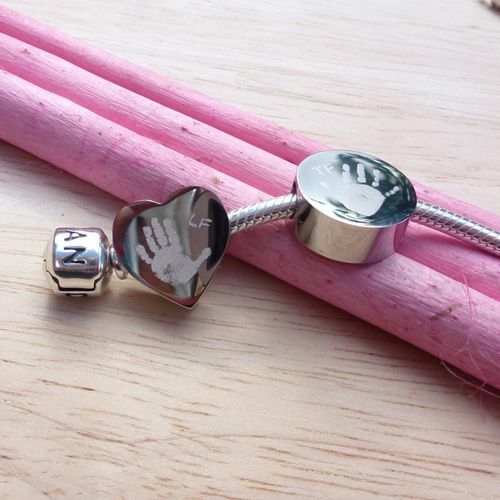 This unique keepsake will be personalised with your loved ones miniaturised hand or footprint. 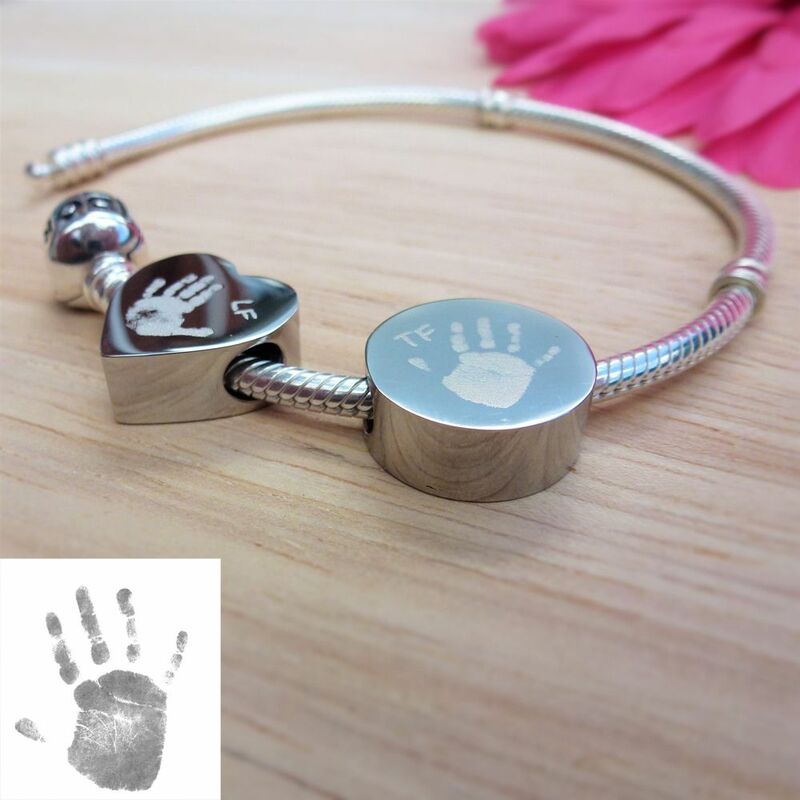 The charm is suitable for either a handprint or a footprint to be engraved. 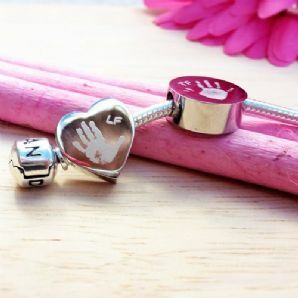 One side of the charm will be engraved with your print and child's initial's (Maximum 2 Characters) and to the reverse side of the charm we will engrave a small message (maximum 25 characters including spaces). The charm is made from high quality stainless steel, which is polished to a mirror quality shine. We love using stainless steel in our products as it offers a cheaper alternative to silver, but is also hard wearing and doesn't tarnish overtime. These charms fit onto many high street bracelets, such as Pandora etc.. 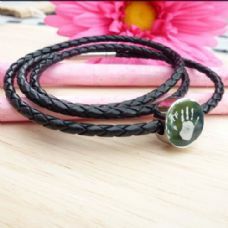 If don't already have a bracelet, please take a look at our other listings as we have some styles of bracelets available in our shop. The charm is available as either a heart or circle charm, please select your choice upon ordering. PLEASE NOTE THE LISTING IS OR ONE CHARM ONLY AND NO BRACELET IS INCLUDED. Option 2 Inkless Kit (Additional charge) - An inkless kit can be purchased for an additional fee when ordering the bracelet. Our mess free kits are easy to use and consist of an inkless wipe and 3 * A5 sheets of special coated paper, each pack comes with instructions for use. To order please enter your child's initial (Max 2 Characters). Please choose the charm shape required, we have a circle or a heart charm available. Please Enter the message you would like engraving to the rear of your charm (We would recommend no more than 25 characters including spaces due to the small size of the charm).